By sponsoring promotions and events, downtown Payette can project an image of an exciting place where things are happening. Promotions and events designed to draw visitors on an ongoing basis are an essential element of the downtown. Payette has a colorful history of events that carry on today with the Apple Blossom Festival, which was started in 1923. Over the years numerous merchant’s promotions have been held and in recent years consisted of an Easter celebration including a bonnet contest and egg hunt; Mother’s Day with petunias and marigolds to women; Crazy Days; sidewalk sales; children’s pet parade; Payette County Fair; Children’s Halloween parade; Thanks-giving promotions with drawings for apples and turkeys; and an Old Fashioned Christmas. These established events are an excellent group to expand upon. The oldest and best known event is the Apple Blossom Festival. 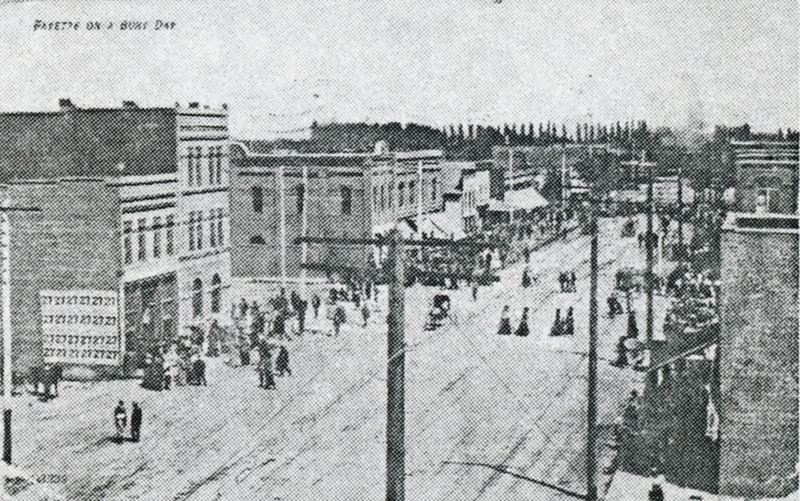 Payette’s Apple Blossom Festival was originally sponsored by the Women’s Portia Club, beginning on May 8, 1923. Initially organized as a fundraiser, the festival grew to become one of the outstanding Spring features in the State of Idaho. This year’s festival week included the Apple Blossom Queen coronation ceremony; Policeman’s Ball; Apple Core Open Gold Tourney; Ice Cream Social at Central Park; carnival at Kiwanis Park; antique and steam tractor show at Bancroft Park; a breakfast; run; parade / award ceremony; and art show in Central Park. Future improvements to the festival should include more emphasis on agriculture through such activities as a Maudie Owens apple bake-off contest. More public relations are necessary in attracting greater attendance from outside communities. Another major activity is Payette’s Old Fashioned Christmas opening held on November 30th when the city is illuminated by an attractive display of Christmas lights along 8th Street. Carols are sung, candy canes and coffee are available, and Santa Claus arrives on a fire truck. The seasonal festivities continue with a Christmas tree lane contest featuring a night of horse-drawn wagons taking spectators around to look at decorated homes. Also, merchants’ display-windows are decorated or painted, with the winner receiving a traveling trophy. Table 7 outlines a proposed Payette calendar of events. Most are existing events. Promotional events to be considered in the future include a Harvest Day’s Festival and a bike race loop through Payette, Fruitland and Ontario. Flea Market on 1st Ave. N.
Central Park and the expanded sidewalk area provide a setting for various activities and events. Events should focus excitement on downtown Payette and should be scheduled to compliment the weather and merchants’ needs – such as seasonal introductions and clearance requirements. Festivities should offer things to see and do, free entertainment, fun food to eat, and an atmosphere of escapade and play. A visitor should be guaranteed a good time with lots of activities to participate in or the option of just being a spectator. Events should be money makers, generating some or all of their own funding and hopefully assisting fund-raising efforts for the sponsors. Advertising co-sponsors such as a local company, corporations, beer company or beverage distributor can also be helpful in funding special events of the Merchants’ Committee. At the beginning of each year the Chamber’s Retail Merchants Promotion Committee should adopt a calendar of events and establish an annual budget for activities and advertising. Four major events would involve community-wide participation while other store promotions would be best handled by specific types of stores. The important objective to accomplish is to have an array of retail activities that keep coming at consumers; something should be scheduled every month so that consumer attention stays on the local merchants. The formation of a Business Improvement District (BID) is recommended to raise annual revenues to support promotions and events. Through the BID each merchant within an established boundary is assessed a monthly fee based on store size and business type. Every merchant is required to carry his fair share of the promotional load. This funding will allow the merchants to ambitiously and aggressively promote the city center and its businesses. Putting on events requires a great deal of work for the initiators and planners. Major events may take six months of planning. Likewise, creating enthusiasm and maintaining it requires a professional coordinator and full cooperation of the business community and local residents. Event planning should reach out and involve numerous members, recruit committee heads and divide the workload into manageable sizes. Good pre-publicity is a necessity for people events. Advertising should begin a minimum of two weeks before the event and include an event poster. Public service announcements should be fully utilized and the complete fair schedule should be listed in the newspapers. After an event an evaluation should be conducted to improve the events with an ongoing event workbook maintained with advertisements, forms, clippings, etc.